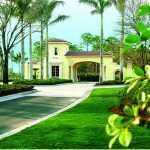 Those seeking a Florida residence that offers an impeccable lifestyle and top-rated golf amenities in a desirable South Florida location near Atlantic beaches have found the best of all worlds at Old Palm Golf Club. Along with beautiful estate homes, a championship Raymond Floyd-designed golf course and a superior private Club experience, residents discover a sense of ease and privacy so often lacking in other gated communities. For peace of mind, a team of dedicated privacy personnel is on hand 24/7 at the Old Palm gates to greet expected non-resident guests and announce their arrival to residents. The privacy team also patrols public areas and individual neighborhoods around the clock to make sure that life at Old Palm remains carefree and enjoyable. Additionally, they perform many courtesies, such as alerting residents of open garage doors or car windows, and checking homes when owners are vacationing. Old Palm privacy personnel, highly trained first responders certified in CPR and AED (Automated External Defibrillator) use, are also responsive, skillful and considerate in the event of medical emergency. In fact, every aspect of life at Old Palm is approached with consideration and sensitivity to privacy. Residentsâ homes are situated on home sites that are discreetly separated from direct sightlines with individual water features, nature preserves, water or golf course abutment. However, homes situated along the golf course are also veiled with beautiful, natural vegetation and a course architecture that allows for lovely views without intrusion. This luxury retreat far from the realities of work and everyday life was developed with complete respect for the lush acreage that was once owned by John D. MacArthur. Such care was taken in the planning of Old Palm to retain indigenous flora and fauna and maintain the integrity of the acreage that the community proudly bears a Gold designation from Audubon International. When they drive through the attended gates of Old Palm Golf Club and sink into a comfortable chair at the Club, where vigilant staff provide a completely relaxing atmosphere, Old Palm residents know theyâve found their sanctuary, too.